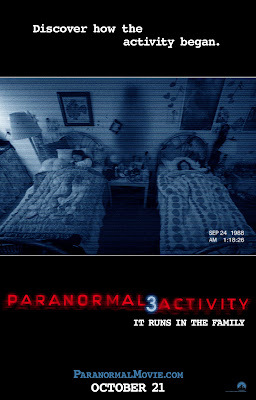 Mendelson's Memos: Review: Paranormal Activity 3 (2011) proves that the third time is not the charm. Review: Paranormal Activity 3 (2011) proves that the third time is not the charm. For better or worse, the Paranormal Activity series is the Where's Waldo? of horror films. You know when the lights go down and a graphic pops up on the screen telling you what day it is that something SPOOKY is going to occur. But since you don't know what it is, you somewhat nervously scan the screen for any clue at where the creepy sight or randomly loud noise might come from. It's an effect that makes the film the closest thing to actually walking through a haunted house ("Hey, that door's unlocked... look out! "), which explains much of the franchise's appeal. Half of the fun of this kind of movie is watching the crowded audience react like puppets at just the right moments. It's ironic that this series, which arguably looks and sounds no better on a big screen than it would as a bootleg viewed on a smart phone, is one of the few that absolutely demands to be seen in the biggest, most packed theater one can find. As a party movie, a game of sorts among friends or fellow moviegoers, it has its value. But as a movie, this third installment is both a bit of a cop-out and, thanks to its status as a prequel, a bit of a narrative cheat. The plot - It's 1988 and young Katie Ray (Chloe Csengery) and Kristi Ray (Jessica Tyler Brown) are living with their parents when things indeed start to go bump in the night. Since their father (Christopher Nicholas Smith) is a videographer by trade, he soon decides to set up cameras around the house in hopes of figuring out why all the weird stuff keeps happening. And that's about it. The fact that this is a prequel hampers the film in several potent ways. First of all, we know that the two young girls are in no mortal danger, since we see their eventual fates in the earlier pictures. Second of all, the fact that this film involves a family of four with two young girls puts a damper on the level of intensity for most of the film. Put simply, it takes a lot less for a family with kids in it to get scared into getting the hell out of the house than it would for a young childless couple. So for 2/3 of the picture, there are next-to-no real scares, with two of the biggest 'jump' moments literally being fake outs. We play the usual waiting game, but it becomes quickly apparent that nothing scary is going to happen during the day (which was a problem in the earlier films as well), and very little pronounced imagery or noises are going to be seen or heard until pretty close to the end. There is an early tease that is surprisingly potent (it involves more special effects than this series is known for), but nothing particularly disturbing happens for nearly the entire film. We wait for loud noises and/or startling sights but they rarely if ever come. Obviously the anticipation of fear is scarier than the shock itself, but after so many false beats or ineffective would-be jolts, the anticipation wears off and leaves only boredom. Equally as troubling is the absolute lack of tension in this household. The first Paranormal Activity (review HERE) at least worked as a compelling portrait of a young woman driven insane by a seemingly random haunting. When we weren't being scared, we were somewhat engaged in her personal drama. The second film also had a token amount of tension as the young couple struggled with the unexplained phenomena that threatened their newborn son. But this time around, the mood in inexplicably light. There is more humor this time around and, more importantly, an air of carefree lightness. Since there are few true shocks, there is little real trauma for our characters. Thus there is no drama to compensate for the lack of scares. For nearly the entire picture, we are simply watching a happy and uninteresting family go about their business while a light occasionally falls from the ceiling. And when the third-act tension does finally come, the film shoots itself in the narrative foot by making the mother (Lauren Bittner) into a classic 'continuously wrongheaded authority figure'. She always says just the wrong thing and/or refuses to look at the video that would clearly prove that something is amiss, which turns much of the last third of the film into a giant Idiot Plot. Then there is the finale. I would not dream of revealing what occurs, but I will try to make some spoiler-free comments about it (if you want to skip this paragraph just to be safe, I won't be offended). This is of course a prequel and since the prior two films make next-to-no mention of the events of this picture, it would stand to reason that nothing all-that traumatic occurred back in 1988. But, without going into details, the finale of this picture certainly fits into the kind of climax that this series is known for. So, we are left wondering just why the grown-up sisters are seemingly unscathed by the major events that occur during this prequel. If the events of this picture happened to me when I was ten years old, I'd be pretty horribly scarred by them and I certainly wouldn't seemingly forget about the whole thing. Anyway, Paranormal Activity 3 is hobbled both by its status as a prequel (which makes the last reel quite confusing) and by its strangely lighthearted tone. With a lack of any real dramatic tension, as well as a surprising lack of potent scares, the film exists only as a fun-house exercise, something to be enjoyed with friends. In that sense, it is somewhat effective (I did enjoy watching the other audience members watch the film with their hands over their eyes), but as a stand-alone horror film, it's pretty worthless. I wonder if these movies are a slight commentary to men about knowing the women you get involved with. I wouldn't say it's worthless. It does lack those things you mentioned, therefore not making it "great" but damn was it scary when it decided to be scary. That's all I can ask for from this. The second one remains my favorite of the series, but this one creeped me out the most and stayed with me longer. I've loved all three in the series, and although I ask not to be spooked out by more of these, I will gladly pay for a fourth if it comes out. And as a prequel, it does fit in with the others. In one, if not both, it was mentioned that the sisters experienced "something" and that their grandmother was involved in "something" and that there was a pact made to deliver the next born son to the demon. They may have repressed the memories, then they resurfaced with the events of the first two movies.